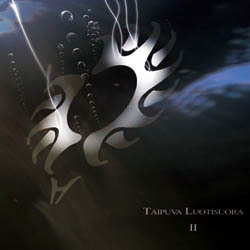 Taipuva Luotisuora are an interesting Finnish band and this is their third release, so I am not sure why they call it 2. Perhaps because it is their second official CD. Anyway, the band is continuing to evolve in style and have added a vocalist on 4 of the 9 songs. Additional players (mostly family members) fill in with flute and cello. While the previous CDs were very much in the progressive space rock vein, this is more melodic-poppy in a sense due to the melodic singing in English (with a Finnish accent!) on some of the songs. Out of the Chrysalis starts the CD with some electronics and some spacey sounds and an eastern sounding riff before the drums kick in and the track takes off. This track is mostly instrumental with only a few lines of lyrics. Next up is Sable Road, and this highlights the new direction that the band is heading. The song begins with piano and flute and has this melodic radio friendly feel to it but it still remains a bit spacey and has some nice violin. North-East Passage is back to the more complex time signatures and instrumental music that the band excels at. I really like the synthesizer passages on this track and all the cool other instruments that get mixed in as well. Chimaera Monstrosa tells a very interesting story and the music that accompanies it is fantastic. This song is a real classic composition with beautiful music, cello, and great singing. Uotila is a short instrumental track with programmed drums and synths by Ville. Maybe he made this track by himself? Ozrics fans will like this one! Unaja Infinite Laser starts like a dark trance track and remains quite electronic and spacey as well and this leads straight into the acoustic start of the Crane, the last song with singing. Nice song but it seemed a little short, like it was begging for an extension for the band to stretch out?? Anyway, Emerging Disagreement (Between Nations) is a slow starting track but is quite intense and the heaviest track on the CD and very Crimson inspired. Äyhö ends this excellent CD and is the longest song and one of my favourites on the CD as there is so much cool instrumentation mixed in while the groove develops. All kinds of instruments. This is a CD that really grows on you though. An excellent step forward for this young Finnish band. For more information you can visit the Taipuva Luotisuora web site at: http://luotisuora.kaakao.fi.